D’Opus & Roshambo are set to unleash some new material, and are spearheading it with their new single Come Find Out, featuring Chanel Cole on the hook (alternatively, off the hook, depending on how you look at it). Ross Garrett (D.Opus) and Rowan Thomson (Roshambo) met in 2003; D’Opus already an established DJ having supported everyone from the Jungle Brothers, Q*Bert, Mr. Thing and De La Soul, while emcee Ro had built up an impressive reputation for spreading the hip hop gospel through his long-running show on 2XX FM. Taking inspiration from the golden era of hip hop, classic funk and contemporary drum .n. bass, Ro & D.O came up with tight blend of story driven hip hop and rich musical diversity. Having worked together for only a few months the lads released a promotional single The Question, which received national airplay on Triple J’s Hip Hop show. The duo’s first EP The Question was released in 2006 and distributed through legendary local imprint Obese Records. 2008 was a massive year for Ro & D.O, seeing the release of their full-length album The Switch (Mercury Switch/ Shogun). Their single Million Dollar Bill proved to be a bona-fide Triple J favourite, spending a good portion of the year on high rotation, and being in the Top 100 most played songs on the station for the year. The duo received further support by being featured in JMag’s ‘Home & Hosed’ and Rosie’s Vox Pop saw her roaming the streets with Million Dollar Bill in hand. This culminated as D’Opus & Roshambo were chosen as part of Triple J’s Next Crop in November ’08 (alongside Cassette Kids, Pez, Philadelphia Grand Jury, Horrorshow, and Oh Mercy), with the second single The Basement, featuring Canberra indie-rockers Hancock Basement. Far from being content with airwave representation, D’Opus & Roshambo played a flurry of shows in, supporting the likes of Krafty Kuts, Muph & Plutonic, TZU, Downsyde, Koolism, Low Budget and The Bamboos, and hitting the stage at Soundscape (Hobart) and Corinbank. Million Dollar Bill and The Basement also received rotation on ABC RAGE, JJJ TV and Channel V .
‘We’ve been very busy over the first few months of 2010 with a few major projects – the most significant of which is our second album ‘Past Time’which is nearing completion. It’s been another journey-and-a-half, but we are very happy with the way it is sounding and are very close to having it ready for release and giving it over to the people! Our second album has been a long time coming. It is the album I’ve wanted to make ever since I started this emcee thing. It is the type of record that has been in our minds waiting to be born and made real. Where ‘The Switch’ was about making the leap from EP to LP, from making casual songs to a full-blown full length record and taking ourselves more seriously, this new record will be our first cohesive album with a tangible theme at its core. ‘Come Find Out’ is the ‘we’re back’ and it is ‘business as usual’ tune – a throwback to the party braggadocio hip-hop tunes of old and paying homage to the classic Eric B & Rakim ‘def with the record’ concept, but with a modern D’O & Ro twist of course. It is about getting involved, getting into the vibe, checking out where our new sound is headed and joining us for the ride. Chanel jumps on board to give the hook an added disco-flavoured bounce and D’O’s beat is full of thick rolling funk and a few surprises throw in for good measure. 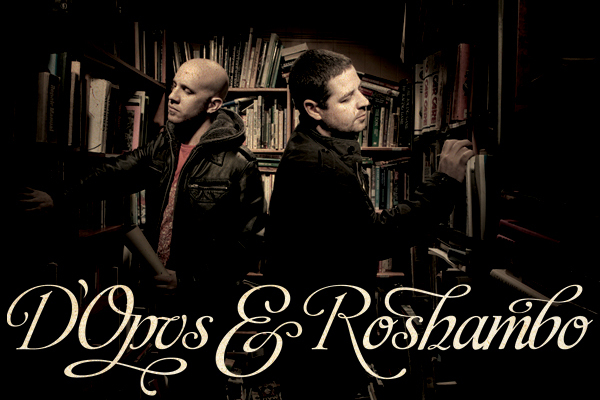 2010 is upon us and D’Opus & Roshambo have something keen to share Come Find Out . You can grab the tune below or on the guys Triple J -Unearthed page here – don’t hesitate to drop a comment and let em know what ya think.